One thousand days have passed since Malaysia Airlines flight MH370 disappeared on March 8th, 2014, after its departure from Kuala Lumpur International Airport. The Boeing 777 carrying 227 passengers and 12 crew was bound for Beijing and to this day the only trace of the aircraft has been 22 pieces of debris washed ashore off the coast of the East African continent in places like Mauritius, Madagascar, Le Reunion and mainland beaches in Tanzanian and South Africa. Some of the debris has been conclusively identified as part of 9M-MRO, the registered Boeing 777 which serviced the ill-fated flight. Other pieces of debris are "almost certainly" from the aircraft according to the official investigation team, while other pieces have yet to be identified and conclusively linked. For the families of Malaysia Airlines flight MH370, it is the only tangible and physical evidence of what remains of the aircraft and what happened their loved ones. Frustrated by how the current search is going and the lack of answers as to what happened, recent debris finds have prompted seven relatives of those lost on flight MH370 to travel to Madagascar and raise awareness about how local communities and members of the public can assist the investigation to find debris from the aircraft washed ashore off the eastern coast of Africa. 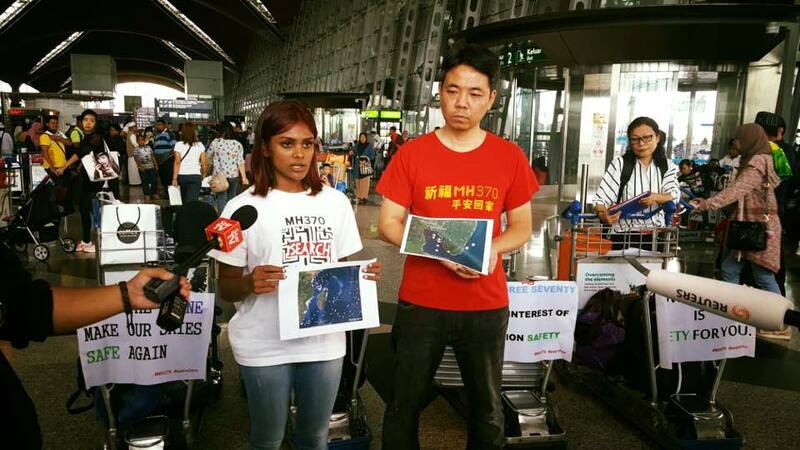 The relatives gave a press conference today (December 3rd) at Kuala Lumpur International Airport before they departed for Madagascar for a week-long trip to raise awareness in the region about MH370. A two-and-a-half years search of the southern Indian Ocean, which began in 2014 and was based on Malaysian military primary radar and a series of pings picked up by British-based satellite company Inmarsat, has led to a search area of 120,000 square kilometres far from the western coast of Australia. Tasked by the lead investigation team and government in Malaysia, the Australian Transport and Safety Board (ATSB) contracted Fugro and Phoenix International, using sea vessels equipped with side-scanning sonar and robotic AUV and ROVs, in an effort to locate the final seabed resting place of the aircraft and its 239 souls. This search is due to be completed and suspended in Jan/Feb 2017 should no aircraft debris field be found on the seabed by then. On 30th March 2014, then Prime Minister of Australia, Tony Abbott MP, established the Joint Agency Coordination Centre (JACC) to coordinate the Australian Government's support for the search into missing flight MH370. The JACC is the coordination point for whole-of-Australian Government information, messaging and stakeholder engagement, including keeping the families of those onboard and the general public informed of the progress of the search. The JACC has made it clear that without "new credible evidence" the search in the southern Indian Ocean will be suspended. In November 2016, all parties and representative governments in the investigation and search for Malaysia Airlines flight MH370 met in Australia for a three-day meeting in what was described as a back-to-basics, open-ended reassessment of all available data. The results and conclusions of this meeting will be presented in a report at some point during 2017, though a specific date has not been agreed, it is expected to take several months before the report will be publicly presented. Perhaps the most disturbing aspect of missing flight MH370 is that the collective efforts of multiple governments and aviation bodies, a $180 million search in the southern Indian Ocean, and an official aircraft investigation has reached ground zero and produced little of real substance to address the obvious Cry for Truth into the Where, How and Why of this tragedy. 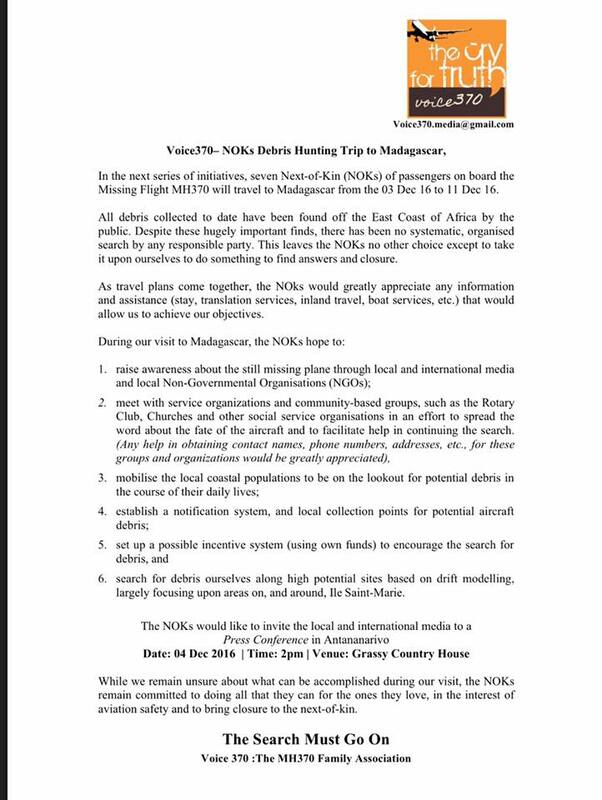 Moreover, what the official investigation has offered up as tangible and physical evidence of 9M-MRO has not come from its sea search efforts, but rather from conscientious citizens, and independent and interested parties examining what available data is made public. What remains of Malaysia Airlines flight MH370 began to wash ashore some time during 2015 as floating debris emanating from the southern Indian Ocean impact area where 9M-MRO and its souls met their end. Johny Begue, a sanitation worker on the beaches of Le Reunion, off the eastern coast of Africa, recalls how he found wing wreckage on July 29th, 2015, later identified as a right wing flaperon. "I was searching for something to be used to collect rubbish, and I found the stuff on the beach. I thought it was probably a part of an airplane wing. There were a lot of shellfishes attached it. My colleagues and I carried it onshore and we believed that if it was a piece of plane wreckage, then there must be some casualties. We were sad, and we wanted to put it at a proper place and mourn the victims with flowers. One of my colleagues told the local radio station about this and the radio station contacted police immediately,"
Blaine Gibson, an American lawyer from Seattle, after he attended a one-year MH370 commemoration by relatives in Kuala Lumpur in 2015 was inspired to undertake a self-funded hunt coastal search for debris from the missing plane that has taken him everywhere, from the Maldives to Mauritius, Mozambique, Madagascar and Myanmar. Gibson, an adventurer and investigator by nature, sought the help of University of Western Australia (UWA) Professor of Coastal Oceanography Charitha Pattiaratchi. Pattiaratchi had been modelling the potential path of debris based on ocean currents and predictions of where impact debris would float from the area the aircraft was believed to have went down. While the eastern African coast in general was a clear area to search for coastal debris, Pattiaratchi specifically identified the coasts of Madagascar and Mozambique as primary areas that could be likely places to find aircraft debris from MH370. Ultimately, over the period of a year, Gibson would discover more than nine pieces of debris, several have already been confirmed to come directly from 9M-MRO or certainly from a Boeing 777. And in 2016, Gibson, along with a growing list of other people like Luca Kuhn von Burgsdorff and Neels Kruger have found debris from the missing aircraft on beaches up and down the coast of Africa. One of the most significant finds so far was a piece of 9M-MRO's right side wing flap found by a group of local fishermen on the shores of Pemba Island off the coast of Tanzania in June 2016. Recently released information by the ATSB has revealed that investigators and Boeing do not believe the wing flap or flaperon were in a deployed position for a landing/ditching end-of-flight scenario. What is becoming increasingly troubling to relatives of those onboard MH370 is that the official investigation conducted by government and aviation authorities in Malaysia, Australia and China continue to primarily focus on a deep-sea search zone in the southern Indian Ocean which has so far found nothing of the missing aircraft. 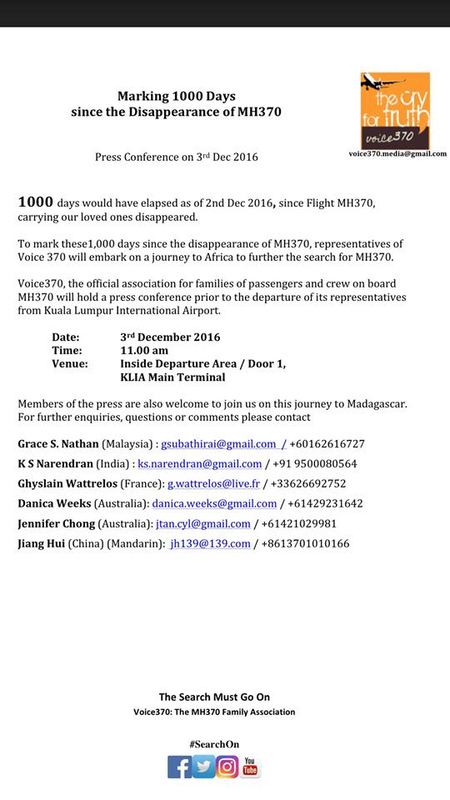 Voice370 (Cry for Truth) is a supportive body set up by relatives of those onboard MH370. Following the recent joint meeting in Australia by the JACC of the official teams involved in the investigation, as part of its review and back-to-basics strategy, Voice370 has called on the investigation authorities to do more to focus on coastal debris finds and liaise with local African authorities to conduct coordinated searches for debris washed ashore. Though previously promised, no such coordinated operation has ever taken place, and potential coastal debris from flight MH370 continues to be found by ordinary citizens, not official investigators or local authorities. It has prompted relatives to travel to Madagascar this week and next week to promote awareness of the existence of potential coastal debris, alert local communities, reach out to local authorities, and provide a brochure and action points debris finders should be aware of. 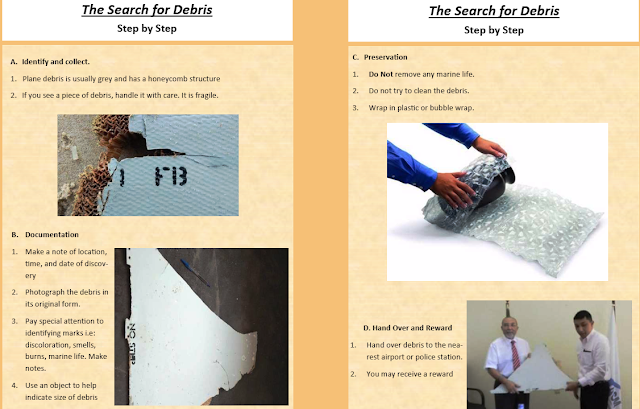 Finders of potential debris should not only follow the above guidelines, but also ensure that it is photographed 'in situ' where first found and number or lettering be carefully recorded visually and noted down in writing. Avoid taking home debris. This can lead to additional damage or corruption/contamination of what is ultimately technical and criminal evidence. Debris should be passed on to the local/national aviation authority to preserve the chain of custody of evidence. Members of Voice370 will be on hand for contact over the coming week to advise finders. In November 2016 Aircraft Investigation obtained confidential files and documents from a secret Malaysian Police report conducted throughout 2014 on missing flight MH370. This report is detailed and runs to almost 1200 pages. It is extensive and examines the activity of operations of Malaysia Airlines, the aircraft itself, (9M-MRO), ground staff at KLIA, and activities and background of crew and passengers of MH370. Aircraft Investigation is aware that other people (including those in media organisations) have chosen not only to sit and withhold much of this information from the general public, but instead to actively 'nitpick' data to feed entirely bias news stories, and cajole and intimidate family members, friends and people involved in the investigation to support scurrilous and misleading news stories purely for commercial gain. These people need to examine their own conscience when the time comes. Aircraft Investigation has chosen to release files and documents from this Malaysia Police report in as much context as possible and where and when disclosure of such data does not harm or compromise people named in the report. Further disclosure can be found on the Aircraft Investigation Twitter feed. This continues to be an ongoing process of evaluation and disclosure.